A Girl and Her Scout: Too cute! I love this shadow box/ shelf filled with vintage teacups and saucers. 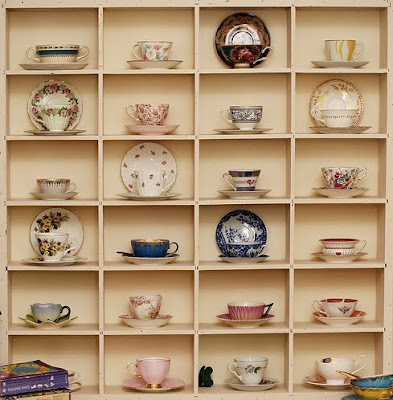 I LOVE TEA and love tea cups and saucers and teapots. This would be the perfect way to spice up a boring wall. By Essie of Penelope Waits found on Daydream Lily. So true, this is darling! I think it would be very easy to make and then it would be great fun to go to different places and get a cup and saucer as a momento.